>Why Not Eat Delicious Local Food? 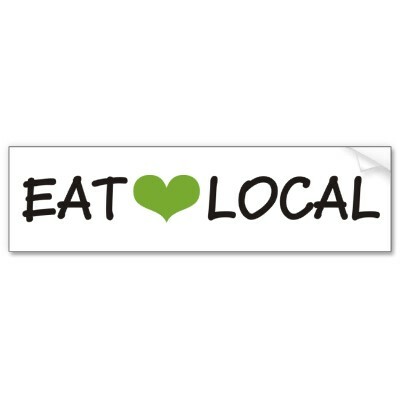 There are many benefits to eating local, some of which may seem very obvious and others which may make you want to think twice. I have owned a local and organic restaurant for a brief period of my life in which I have made many mistakes and had those little triumphs as well but either way it was one of the greatest learning experiences in my life. I have learned so much MORE than I ever thought I could about something that we all do every single day and that is… eating! Eating is one of my favorite things to do and I’m sure I can relate to a lot of people in that way. The problem is that the majority of people these days don’t know where their food is coming from, don’t know what is in their food, and sadly many may not enjoy their food to the fullest. I think one of the reasons that we all have had or have these issues is because we do not have a good relationship with our food. That is why I encourage anyone to go out there and discover local foods from local farms so we are not only supporting local farms but we are also supporting ourselves and our bodies by really HAVING a great relationship with our produce, meats, cheese or whatever we choose for ourselves. Of course it’s easy and convenient to go to the store and buy some perfectly colored produce or ground up beef or highly processed foods, but that will result in not only not having a deeper understanding of food but also in limited choices and duller flavors in your meals. I have also learned in my years of cooking in kitchens that half the frozen food and produce that come in are from distributors and/or from China or Mexico when we could be getting excellent produce and meats right down the street. Why the hell are we getting meat from China?!? Shortly thereafter we started working with local farmers to get products that were raised and grown usually within 30 miles. I’m not one of those local freaks that won’t even drink coffee because it isn’t local but I will buy local meat, produce and herbs when available. Many of you may believe that there isn’t local growers that provide quality produce and meats in your area. This is exactly what I thought at first until I received a two page list of local produce and meats within 30 miles! Here are 8 solid reasons to eat local. Support your local farmers that are growing amazing and very tasty food. Support a families dream to work the land by making a living providing us with food that is not shipped in from 1000’s of miles away and mass produced on “factory farms”. I’m not saying you should empty your cupboards and go buy everything locally, that’s not going to always be realistic. Buying local produce and meats when in season from farmers and markets is realistic though. You can not only buy straight from the farmer but I’ve been seeing more and more grocery stores that carry local products such as Whole Foods or Trader Joe’s as well. They usually have their own local food section and are often found in the organic section as well. You just have to look for it and you’ll get your hands on some tasty food. There’s so many more varieties of foods out there that we just don’t get in a mainstream grocery store. Did you know that there’s over 7500 different varieties of tomatoes? How many do you see in the store, maybe 2 to 4 different kinds? That’s because most of us have been stuck in “sameness” and the factory farmers have caught on to this and now only grow a few select varieties that most of us know today. Did you know that tomatoes aren’t only red? Heirloom tomatoes offer distinct and amazing flavors that you just can’t get in genetically modified tomatos. There’s literally every color of the rainbow and beyond of tomatoes and the same goes for potatoes and many other fruits and vegetables. Get your spouse or some friends involved and come up with delicious dishes. Canning vegetables and fruits such as making your own pickles and/or pickled vegetables and fruits, salsas, sauces, jellies and jams which you can enjoy in the winter as well. Just have fun with all the new and fresh products you got your hands on. Know your farmers and meet new friends that are just as excited as you when a fresh crop of heirloom fingerling potatoes are harvested from a nearby field. I’ve found artisinal bread bakers, butcherers, numerous produce farms, herb growers and the list goes on just from talking to people at farmers markets and farmers. There’s farmers all over that support “food shares” which is a share of food which a farmer grows specifically for you. You usually get a wide variety of seasonal produce and meats delivered to your door or at a drop off location 1 to 4 times a month. There’s a great site and i’m sure many more such as www.localharvest.org/csa which you can locate farmers and markets that participate in this food share program. Get in touch with your local seasons and know what grows in your area. Check with your local farmers and see when it will be harvested. Most farmers will have a list of what they grow and when. There are different vegetables and fruits that grow at their peak at certain times of the year. Eating within the seasons is a great way to not only feel healthy but it will also make you feel more in tune with your body and the seasons. With these programs, you’ll find yourself eating more and more local produce/meats which will make you feel great. Keep in mind as well that a lot of farmers will keep their food share programs running through the winter because there is produce that does grow best in the winter as well. Some farmers also choose to grow various things in greenhouses so they can expand the variety of produce and herbs that they can grow and they can grow more of the product. A lot of local products are often found to be a fraction of the cost than at the grocery store. For example spinach, lettuce, herbs, squash and tomatoes which are much tastier, more beautiful, better for you, and usually picked within 24 hours from when they reach your kitchen table. Produce that comes in from other places can be on a truck for 4-6 days before it reaches store shelves. Of course, some local products will sometimes be more than the mainstream groceries but the extra 80 cents is worth it with all of the hard honest work, love and care put into the foods which can most definitely reflect in the taste. If you eat foods that are local more often than not, they are grown organically which means there is no chemicals or hormones used during the growing or raising process. That means we aren’t filling our bodies with pesticides or hormones every day and believe me your body will love that! You would be surprised the amount of chemicals and hormones used to grow produce that’s in our grocery stores and the end result is dull tasting product. Overall you just have more energy and are more alert just from changing the way you eat. Eating locally grown organic food is a great to improve your immune system, reduce stress, have higher energy and kick that lazy and groggy feeling. Fairly simple, I believe and it can be so worth it! If you haven’t had the chance to watch the wonderful documentary Food Inc. from filmmaker Robert Kenner, it’s a must. You can watch a brief preview at http://www.foodincmovie.com and I highly recommend renting it at your local video store or online at netflix.com. You’d be surprised where our food comes from and how much of it is from one company who uses genetically modified seeds to grow food. They have actually modified seeds to have pesticides be a part of the seed structure so when the produce grows it naturally will have pesticides in the vegetable, fruit, etc.